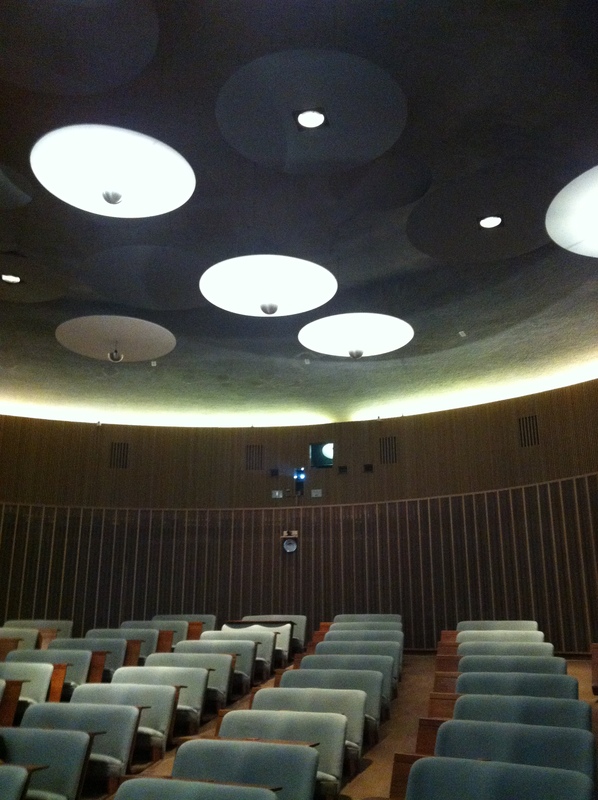 Every year for the last few years I have had the opportunity to attend a lecture at the Shine Dome at the Australian National University in Canberra. The lectures themselves are on high level university mathematics and largely go beyond my level of understanding. However the brilliance of the building itself always makes the visit one to look forward to. This building is the home of the Australian Academy of Science. The Academy is made up of around 450 of Australia’s top scientists. The members are all people who have made a significant contribution to advancing the state of human knowledge. 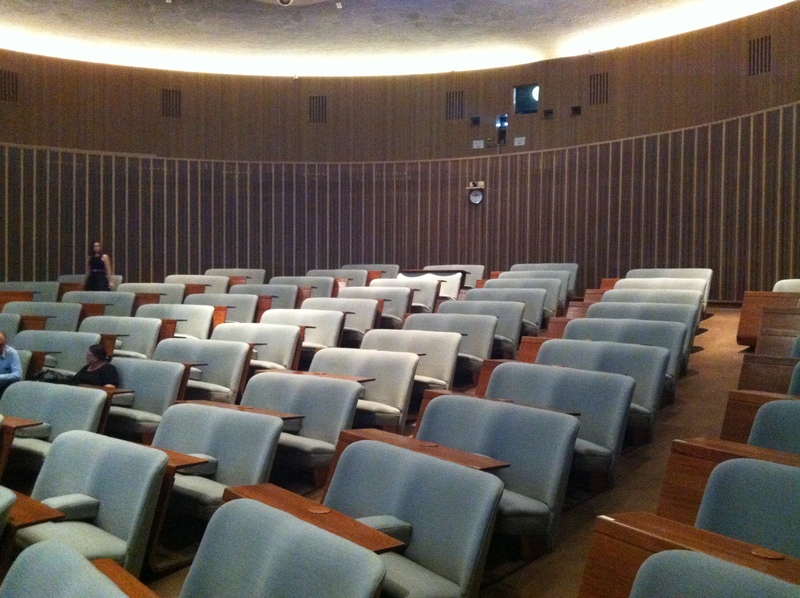 This is a building where Australia’s best minds come together to share their research and discuss their ideas. 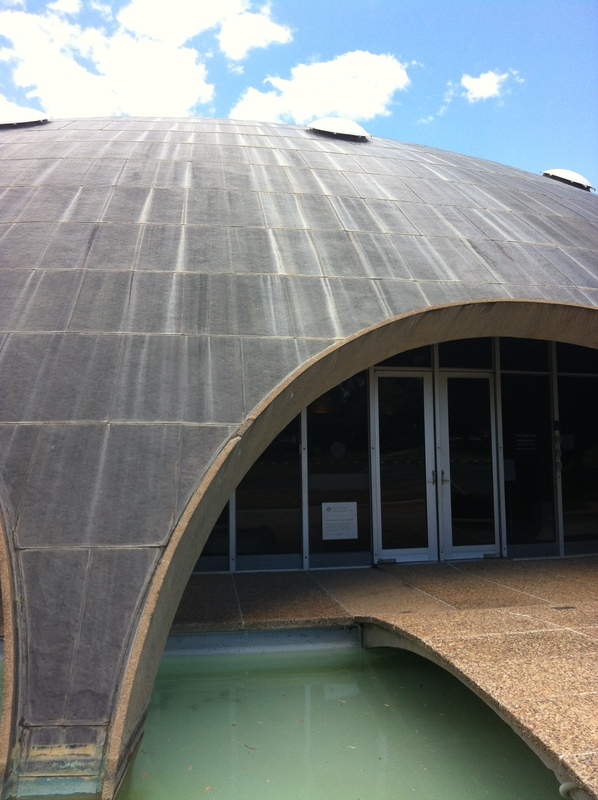 The Shine Dome is of great importance to Australian Architectural history. 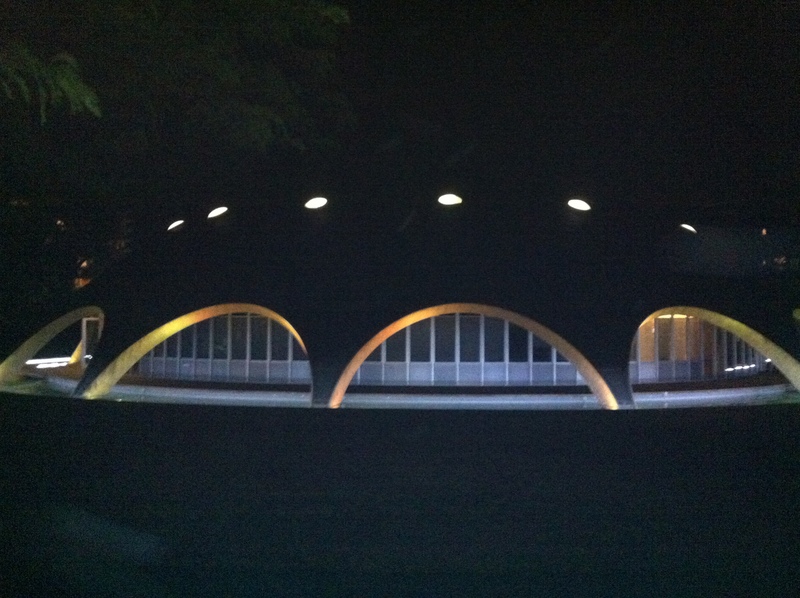 It was designed by Sir Roy Grounds (of Grounds, Romberg and Boyd) in the late 1950’s and was completed in 1959. Remarkably of all the nationally important buildings in Canberra this was the first to be included on the National Heritage List. 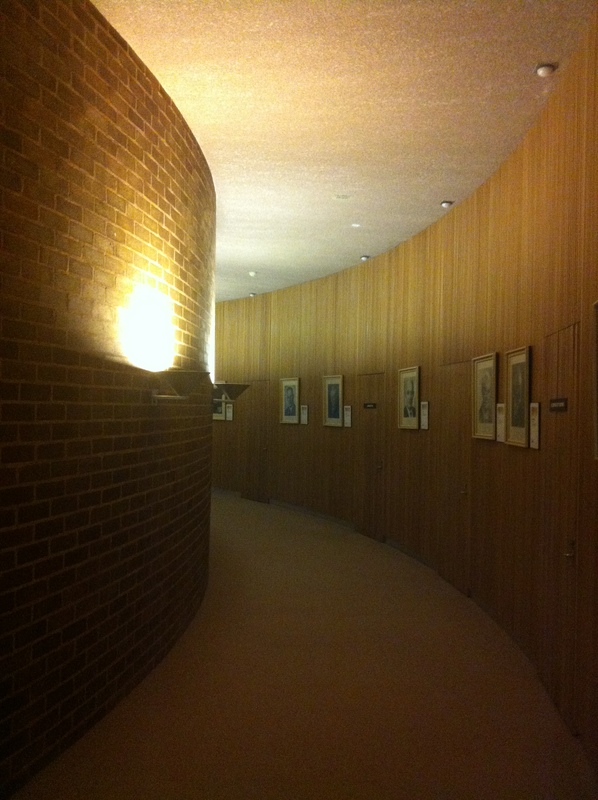 It is also one of seven projects that the Royal Australian Institute of Architects nominated to a world register of significant twentieth century Architecture. The justification for these accolades rests in the clarity of the design concept and the technically innovative construction. From the exterior the single iconic dome appears elegantly out of the ground separated only by a moat of rippling water. An array of copper roof shingles compliments the grassed surrounds beautifully leaving the form to make the key statement. The structure underneath the copper roof is remarkable in itself. The shallow concrete is just 75mm thick and was the first dome of its kind anywhere in the world to be built with circular cut outs at its base. Moving over the footbridge one enters a lobby space which in turn leads to a curved corridor on either side. The space feels quite homely, with familiar textures and earthy tones. The architect’s intentions for a low maintenance building extend to the smooth jointed internal brickwork, which was specifically chosen by Grounds such that it would not gather dust. The original acoustic design for the Shine Dome included batons set at specific positions. These positions led to an uncomfortable visual illusion of motion which was disturbing to users of the auditorium. As a solution, string has been added between the batons to provide a sense of greater solidity, without affecting the overall acoustics. As I sit in my luxurious pod, hearing an accomplished mathematician address an eager audience, under the Milky Way ceiling, it is easy to see why this building gets called the Martian Embassy. My only hope is that the architecture is not lost on the mathematicians as the mathematics is lost on the architect. 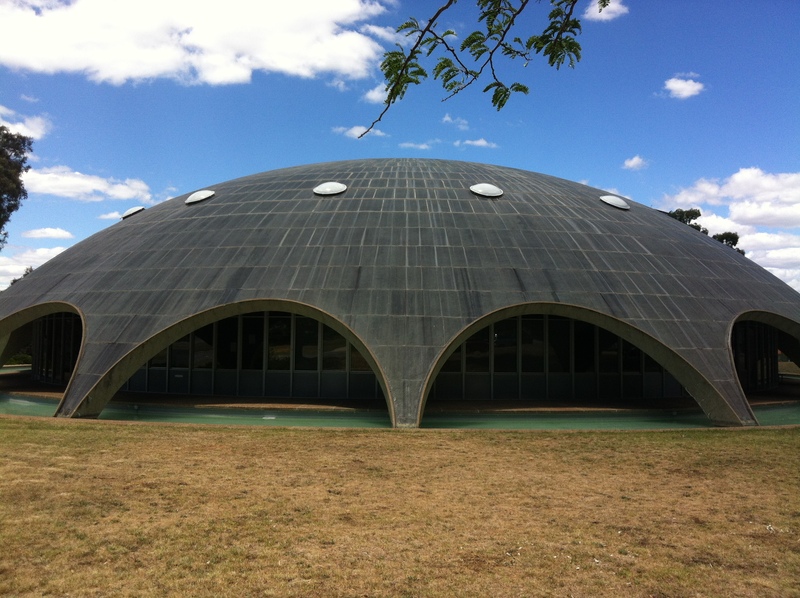 This entry was posted in 2013 Summer Series, all posts, Review and tagged Australian Academy of Science, Grounds, National Heritage List, Romberg and Boyd, Roy Grounds, significant twentieth century Architecture, The Shine Dome. Bookmark the permalink.